Pipeline rehabilitation projects are planned for a minimum number of relatively small access openings. In small diamter pipelines, the locations should be every 500 or 600 feet, or at existing bends and in-line valves. A 5 foot opening is sufficient for our work. For pipelines greater than 36" in diameter, longer lengths can be attempted, and the lining equipment can often negotiate in- line bends. Lining reaches of 2,000 feet are common. Where doemstic and fire services must be maintained during construction, a temporary water supply system is installed. 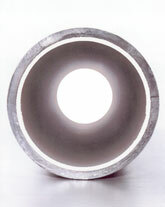 The above ground system is typically 2, 4 or 6 inch diameter pipe, depending upon the service requirements. A. Hydraulic Cleaning. Normally considered only on pipelines over 48 inches in diameter, a steel bladed cleaner is hydraulically propelled through the pipe by either pumping water or using the system presssure. A reservoir must be provided at the discharge end to separate and collect the suspended cleaning debris. Turbidity of the final discharge must be closely monitored. Long lengths can be cleaned in one operation, but disposal of water and cleaning debris can be problematic. C. Mechanical Scraper. Most effective on steel mains of greater than 48 inch diameter, this self-propelled tractor has a rotating scraper head fitted with rows of steel-clawed blades capable of cleaning in and around rivets and other pipe deformations. The travel of the machine and pressure applied by the scraper head to the wall surface allow a very thorough cleaning to be accomplished in one pass. The "fallen" debris is removed by squeegee and a Walsh-designed broom to insure a properly clean surface. In the smaller pipe diameters, the mortar is pumped directly to a rapidly revolving dispensing head from which it is thrown by centrifugal force onto the pipe wall. Specially designed lining winches pull the lining machine through the pipe. Winch speed and pump discharge are carefully controlled to insure the specified thickness. A carefully fitted drag trowel, attached to the lining machine dispensing head, provides a smooth finish. Each service lateral less than 2 inches in diameter is blown free of mortar before the initial set of the lining. For lining larger diameter pipelines, equipment has been developed to go great distances, thus eliminating the need for frequent and costly access openings. The mortar is applied centrifugally as with small diameter lining, but the mortar supply equipment is very different. The mixed mortar is dispensed into a diesel powered speed buggy which travels back and forth from the access hole to the intermediate loader. The intermediate loader is the mortar reservoir for the llining machine, and allows for a continuous lining operation. Mortar is pumped a short distance from the intermediate loader to the lining machine and thrown by centrifugal force onto the pipe wall. Rotating trowels smooth the applied mortar to a hydraulically efficient finish. The mortar discharge and travel speed of the lining machine are infinitely variable, and calculated to insure that the specified lining thickness is applied as speedily as is consistent with good workmanship. The lining train consisting of the intermediate loader, power pack and lining machine is also diesel powered and allows for lining reaches as long as 15,000 feet. Chlorinating and testing of the rehabilitated water main, reconnection of services, removal of the temporary water system and paving the access locations are quick to follow. Within four weeks, the area is back to normal, having sustained a minimum amount of construction inconvenience, and with a better than new water main. CEMENT MORTAR LINING - One of the original "NO DIG" technologies!